With the invasion and occupation of northern France by the Kaiser’s armies, the language of la brute teutonne became an object of hatred and mockery for many civilians left behind the front line. Combined with the loud and omnipresent music of military bands, the alien, guttural sounds of German invaded and occupied the soundscape. The noises were denounced and satirized in the small and ephemeral underground press. However, by studying the authorized press, private journals, memoirs and literary works, we find a more subtle linguistic relationship between occupier and occupied. If efforts at imposing the German language in schools were half-hearted and patchy, the propaganda newspapers La Gazette des Ardennes and Liller Kriegszeitung describe, not without justification, the civilian population’s apprenticeship of German and its sometimes comical attempts at communication with the troops. Private journals, most notably those of schoolchildren, show a fascination with the occupier which encourages language learning. With time, German terminology is assimilated, while there emerges a hybridized ‘Franco-German’. These phenomena reflect the promiscuity, rapprochements and compromises imposed by four years of military occupation. 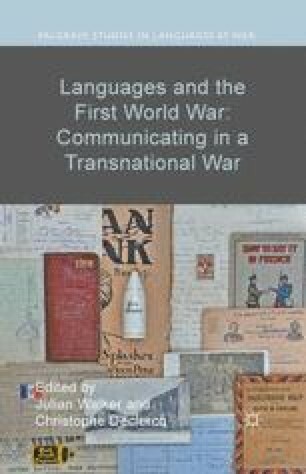 That said, the cataclysm of 1914–18 severely dislocated the teaching of German in north-eastern France, and it would never really recover: as in the rest of the country, there would be profound disaffection with the language of an ‘age-old enemy’.